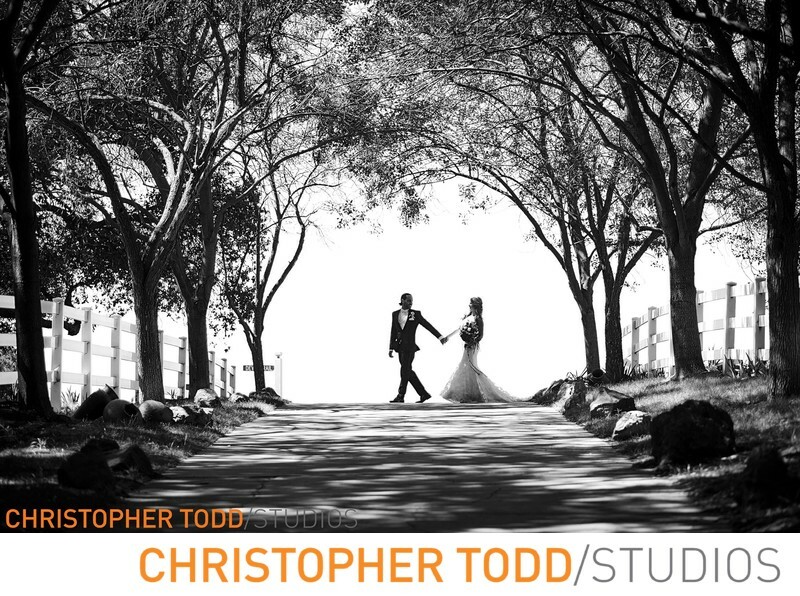 Saddlerock Ranch is a beautiful wedding venue in the Santa Monica Mountains near Malibu. Saddlerocks beauty makes it ideal for wedding photographs. We adore photographing weddings and special occasions at the Saddlerock Ranch & Vineyards. Brides often fall in love with this venue immediately. There are so many wonderful places to create photographs on this property it is like you will get your own styled wedding shoot on the big day. 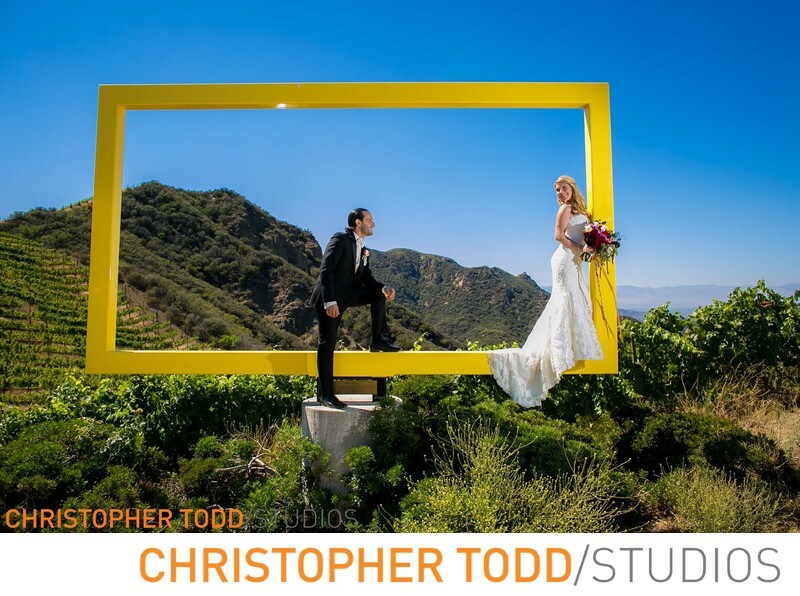 The big yellow frame is one of my favorite spots at Saddlerock Ranch to put the bride, groom or whole bridal party in, on, and around. It is a little precarious getting a bride past the wall of shrubs, and up onto the giant frame, but well worth the challenge when you can make a photograph like this. I love to shoot this spot around mid-day so we can get the big blue sky that compliments the bright yellow frame. Surrounded by spectacular natural beauty with the Santa Monica Mountains in full range your wedding ceremony and reception will overlook 1,000 acres of rolling hills lined with vineyards, manicured lawns, ancient oaks, rose gardens, ribbons of white fences and best of all horses grazing in the background. 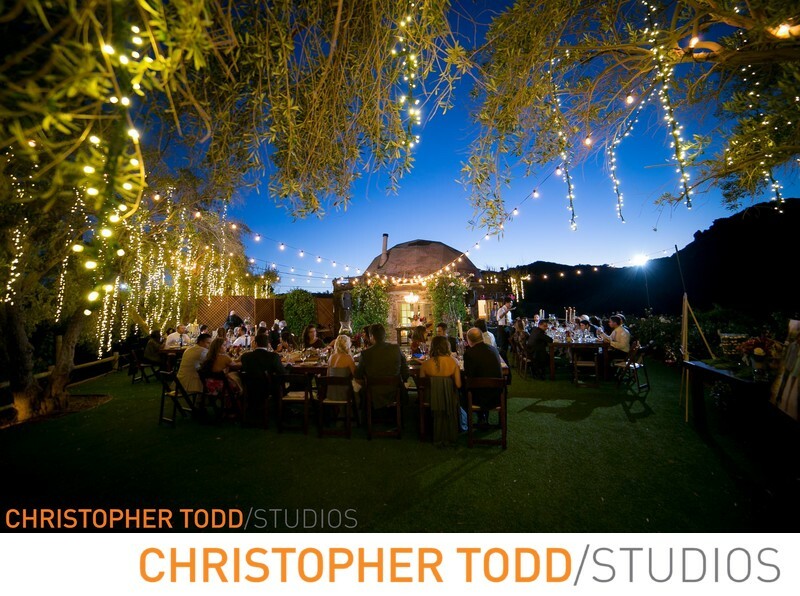 Saddlerock Ranch has become a popular weekend setting for special occasions — including celebrity weddings for stars like Kelsey Grammar, Lisa Kudrow, Don Henley and many more. There are four unique and private locations available to rent for a 24-hour period. It's a picture-perfect environment for exchanging vows or to host an unforgettable event. With custom rock waterfalls, a scenic driveway and oak trees your ceremony and reception will reflect your dream. This space is the perfect place to get creative and build - from tents to hot air balloons and even large scale stages and performance areas, it is complete blank canvas for you to use. This location can accommodate up to 450 guests. The Chateau Le Dome/Vineyard setting is located on a hilltop. The Chateau is an octagonal stone house set on a manicured lawn that is the perfect intimate space for ceremony, cocktail hour and reception. You will love the 360 degree panoramic views of the surrounding vineyards and valleys. For a rustic wedding ceremony vows In keeping are exchanged under a fallen oak tree arch. This location can accommodate up to 110 guests. The newest location showcases the spectacular natural beauty of the Santa Monica Mountains. This setting has a one-of-a-kind 360-degree views of the surrounding valleys, mountains, vineyards and Pacific Ocean! This location can accommodate up to 150 guests. For a unique, vintage experience the Camp Cabernet setting features seven furnished Airstreams, Dalton, Spartan and Shasta trailers, along with vintage cars and a taxi cab, dotting a scenic vineyard-view, creating an intimate yet relaxed atmosphere. This is a photographers dream. This location can accommodate up to 300 guests.